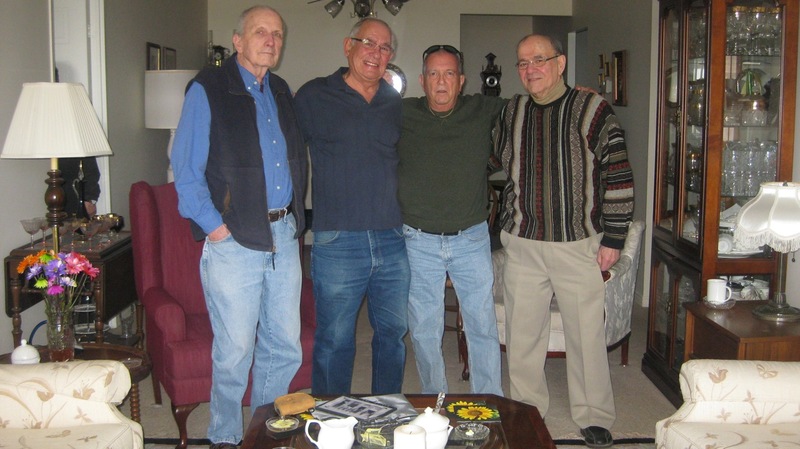 The R & R (relatives and reminisces) jaunt back to Canada included an all-too-brief gathering at the Kitchener home of Joe and Edith Brown that drew former newspaper colleagues Gene McCarthy and Ray Alviano and his wife, Lucille. From left, are ex-Kitchener-Waterloo Record staffers McCarthy, Brown, Scaglione, and Alviano. Before getting to the “before” pic, lemme offer some background. Gene was a two-way reporter/photog who covered everything from prostitutes to politicians (some might ask “What’s the difference?”) to princes and police and also wrote a book of a sensational case he covered. (I now have a treasured autographed copy perched in my bookshelves.) Joe was a photographer who got smart before the rest of us and left newspapering early to open his own extremely successful business. Me, you know from reading “About Us” in this blog. Ray joined the K-W Record sports department more than five decades ago and became sports editor for several years until he retired. 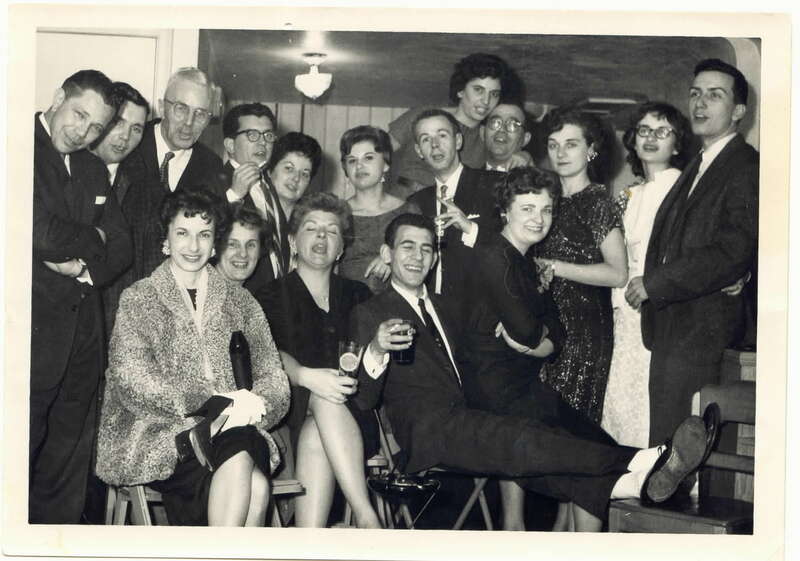 Now pick us out of the above foto taken in my basement recreation room during the 1960 Christmas season. Gene is at the extreme right. Joe is in front center with his feet (and white socks) extended over a chair. Ray is being hugged by Lucille in center rear. I’m the dark-haired guy with glasses and cigarette under the ceiling light. We had a lot of fun recalling escapades of that time in our lives. Amazingly, we had few revisions of each other’s remembrances revived in Brown’s living room a few weeks ago. « Want Beer? Go to the Source.